Subscribe to Energy or Canoils Analytics. Already a user? Login to Evaluate Energy or CanOils or login to Analytics directly. Comprehensive and timely coverage of all oil and gas deals. Evaluate Energy's Global M&A database is designed to let you see the latest asset and corporate valuations quickly and easily, it is used by some of the largest companies in the industry to track opportunities, market movements and their competitors. The software is comprehensive, up to date and simple to use and provides world class data at the click of a button, ready for simple export into models, excel or corporate presentations. Build your own reports or split deals by Acquiring Company, Target Company, Asset Type, Company Ownership Type, Company Country of Origin, Country, Deal Status or Basin. Split Deals by Onshore conv, Shallow water, Deepwater, Shale Gas, CBM, Heavy Oil, Oil Sands, LNG, Pipelines, Refining deals (inc EDC & Nelson), Marketing deals. Fully web-based software that is customisable and easy-to-use, giving complete data transparency and integration with your workflow via Excel. No other information provider gives you tools that can manipulate and produce data as powerfully and as quickly as Evaluate Energy. Each client has a dedicated account manager who provides full technical and analytical support. 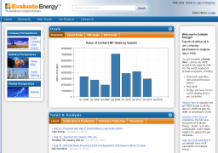 The Evaluate Energy M&A Database is included as part of the Evaluate Energy subscription which also features Corporate Financials and Operating Data, Company Forecasts, National Oil Company database, Global Refinery database, a Global Assets database and over a decade worth of news all for one competitive price. Test Drive a limited version of the product using 2008 data or contact us for a full demo.